While the pain from heel bone spurs can be severe and even debilitating in some cases, the good news is that conservative treatments are usually very effective at treating these ill-positioned calcium deposits. Heel bone spurs are calcium deposits that build up on the bottom or side of the heel bone. In some cases, the spurs are sharp and pointy, like the name implies. However, other times heel bone spurs are smooth or rounded. While podiatrists believe that most heel bone spurs develop as a result of friction, rubbing from ill-fitting shoes, impact or injury to the bottom of the foot, or damage to the arch, other heel bone spurs are present from birth! Some heel spurs can cause excruciating pain while walking or standing, because of their hooked or pointy shape that digs into the heel’s fat pad, but other heel spurs can grow undetected for months, years, or even a lifetime. The most common symptom of heel bone spurs is a sharp, “pins and needles” stabbing sensation on the bottom of the heel bone. This painful sensation is typically the worst after periods of rest or inactivity (especially first thing in the morning). In the case of painful heel spurs, the goal is to relieve pain quickly while taking pressure off the tender tissues that the heel bone spur is aggravating so it can heal. It’s also important to address the underlying reason the heel spur developed in the first place, to avoid recurring issues. Remember, the heel spur is simply a deposit of calcium on the heel bone and has no feeling in it. The pain you may feel while walking or standing is caused when the heel spur pokes into the fat pad of the heel, or the tissues of the foot. Orthotic inserts are usually the first line of defense to treat painful heel bone spurs. A cupped orthotic design with Fascia-Bar Technology is most effective, stabilizing the heel to reduce sliding and friction while you walk, lifting the arch of the foot to relieve pressure on the heel spur itself, and cushioning the damaged fat pad of the heel while it heals. For most people, even severe pain from heel bone spurs improves dramatically with the right pair of orthotics. Supportive shoes are key to preventing and treating heel spurs. Choose footwear that fits properly (no pinching in the toe box, and no rubbing at the back of the heel while you walk) has a thick, flexible sole for maximum impact absorption, and offers arch support. Shoes that rub, chafe, slide around, pinch, or provide little in the way of shock absorption leave feet vulnerable to strain and injury from everyday activities. Worn or poorly fitting footwear can also create gait problems over time as your body tries to avoid pain and irritation caused by the shoes while walking or moving. 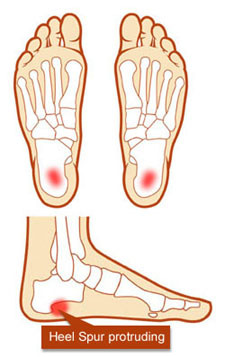 These two simple solutions can go a long way to relieving the pain of heel bone spurs. Take breaks from long periods of standing, give yourself enough time to recover from sports or exercise sessions, and avoid walking barefoot on hard surfaces whenever possible. Icing can be used to relieve swelling, inflammation, and redness caused by heel bone spurs. Apply ice for 10-15 minutes, twice a day, using an ice pack or Ice Therapy Slippers for quick, temporary relief. Most of the time, surgery to remove a heel bone spur is done in conjunction with plantar fascia release surgery. While surgery has a high success rate, most podiatrists recommend it as a last resort because of its expense and downtime. Most case of painful heel bone spurs (90%) respond to conservative treatments like orthotics, proper footwear, rest, and icing. However, if your pain does not improve after a few months of consistent conservative treatments, talk to your doctor about surgery to remove the heel bone spurs.